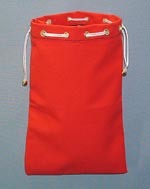 We have made many styles of specialty pouches and bags to hold thousands of items over the years. Most common are the ones that you can just tie closed. Generally we make these from 10.10 once cotton duck because of the softer hand in the fabric. Our pouches whichever styles are made for daily use. They are sewn with a single needle lockstitch machine and then the outer edge is stitched with an overlock/serger machine. Other manufacturers pouches are sewn with just a serger or chain stitch machine. A chain stitch is one where if the stitch were to come loose and you were to pull on the loose thread, the entire stitch would just keep unraveling as you pull on the thread. We can make pouches or small bags to accommodate almost any item (s) you may have. We can put Velcro ( hook & loop ) or small zippers on them instead of ties or any combination. As with all of our products we have hundreds of fabrics and colors on hand or can obtain what is needed to fulfill you intended task. We would be glad to assist to in designing any type of pouch or bag to tailor fit you operation. Please contact us on our toll fee number with whatever your needs are and we will promptly let you know if we can be of service. You can click on the links provided here to give you an idea of a few of the basic pouches as a starting point or certainly as a point of reference.